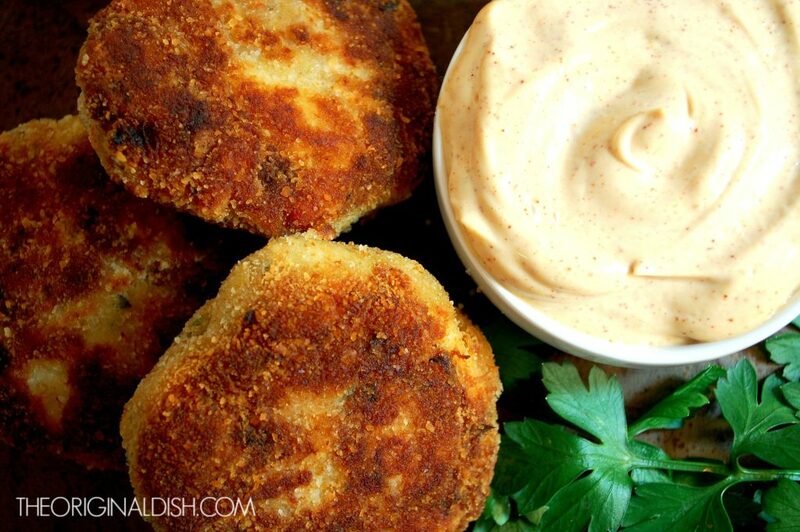 My family and I love to make crab cakes for a Sunday appetizer or for special occasions. Over the years, I have tested and tweaked many different versions of this classic dish, finally ending up with a recipe that we will make from now on. Golden and crispy on the outside, light and fluffy on the inside, creamy sauce on top… you can’t go wrong with that. I pack a ton of flavor into the crab cake mixture, cooking down a combination of vegetables with Worcestershire, Tabasco, and Old Bay. Lemon and herbs add a fresh aroma to the cakes, which are formed into patties using mayonnaise and eggs to hold everything together. I add just enough breadcrumbs to dry the mixture out, and then I coat the finished patties with even more crumbs. When they hit a pan of hot oil, the cakes sizzle until a brown crust forms. The mayo on top is simple enough to whip up and store in the refrigerator until the crab cakes are made. The smoky chipotle flavor and bright touch of lemon create the perfect topping to dollop onto the cakes. Work in an assembly line fashion to make the crab cakes. First form all of the patties, laying them out onto a sheet tray. Then roll each one into the breadcrumbs before beginning to cook them. Once they are ready to fry, work in batches or use a couple of pans. Don’t overcrowd the pan! Combine the mayonnaise, chipotle powder, lemon juice, and lemon zest. Whisk until incorporated. Refrigerate mixture until ready to serve. Preheat the oven to 250°F. Heat the olive oil in a large sauté pan over medium heat. Add the red onion, red pepper, eggplant, salt, and pepper. Cook until the vegetables have softened, about 10-12 minutes. Stir in the Worcestershire, Tabasco, Old Bay, parsley, lemon juice, and lemon zest. Cook for another 5 minutes before removing the pan from the heat to cool. Meanwhile, combine the crabmeat, mayonnaise, breadcrumbs, eggs, mustard, and basil in a large bowl. Add the cooked mixture and mix well until incorporated. Refrigerate for 30 minutes. Form 3.5-ounce crab cakes, shaping them into round patties. Pour the extra breadcrumbs into a bowl. 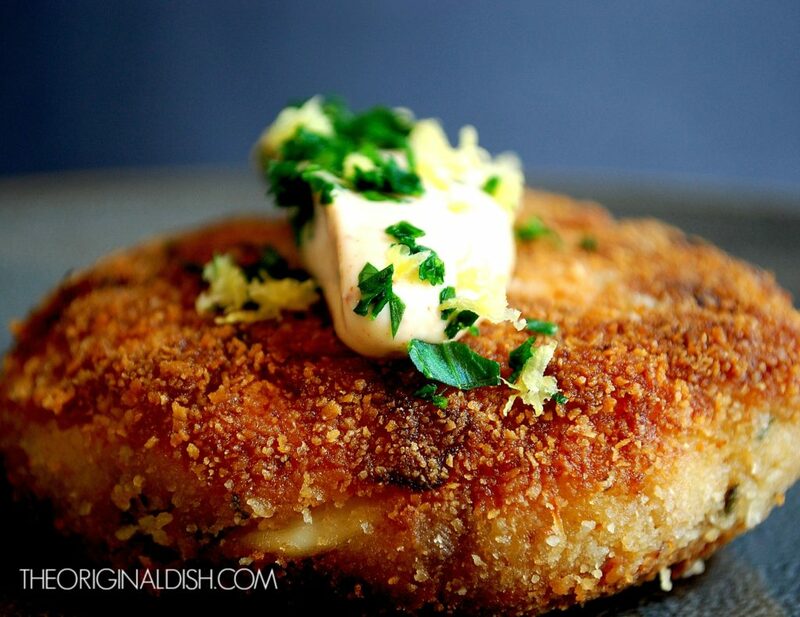 Place each crab cake in the bowl, coating each side with breadcrumbs. In a 12-inch frying pan, heat the ¼ cup of oil over medium heat. Fry the crab cakes until golden brown, about 4-5 minutes on each side. Keep warm in the oven until all of the cakes are cooked. 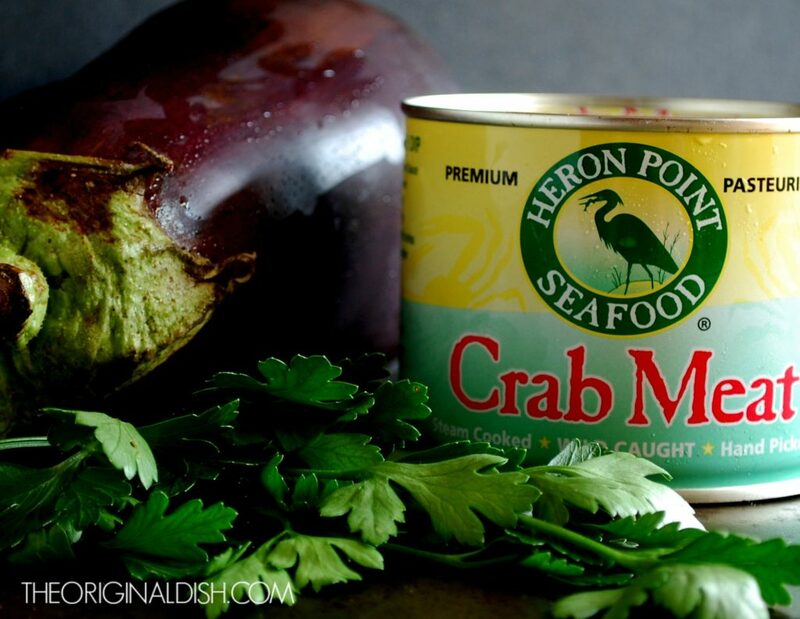 Spoon the mayo over each crab cake, and sprinkle each with parsley and lemon zest. Alternatively, serve the crab cakes on a platter with the mayo on the side. 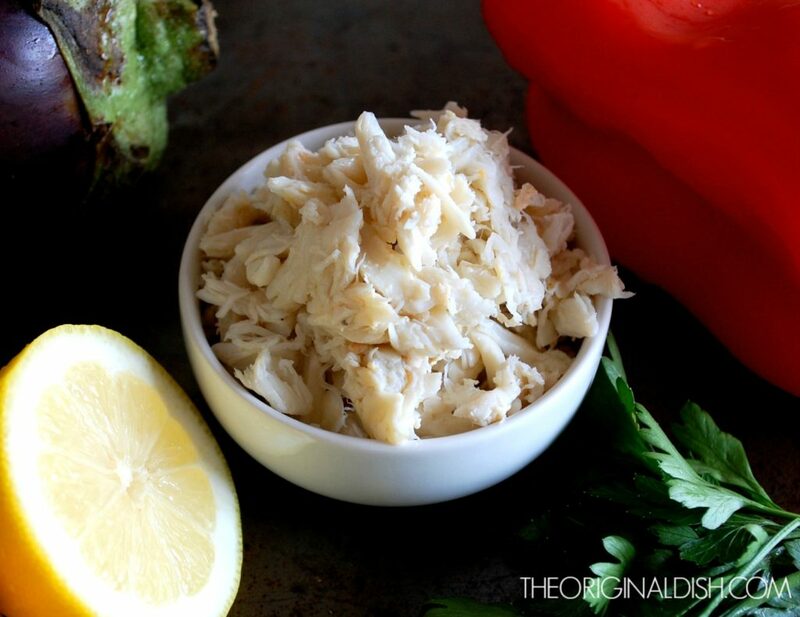 I use 1 lb of lump crabmeat and 1 lb of jumbo lump crabmeat. The lump meat is somewhat shredded while the jumbo lump meat is kept in whole pieces. 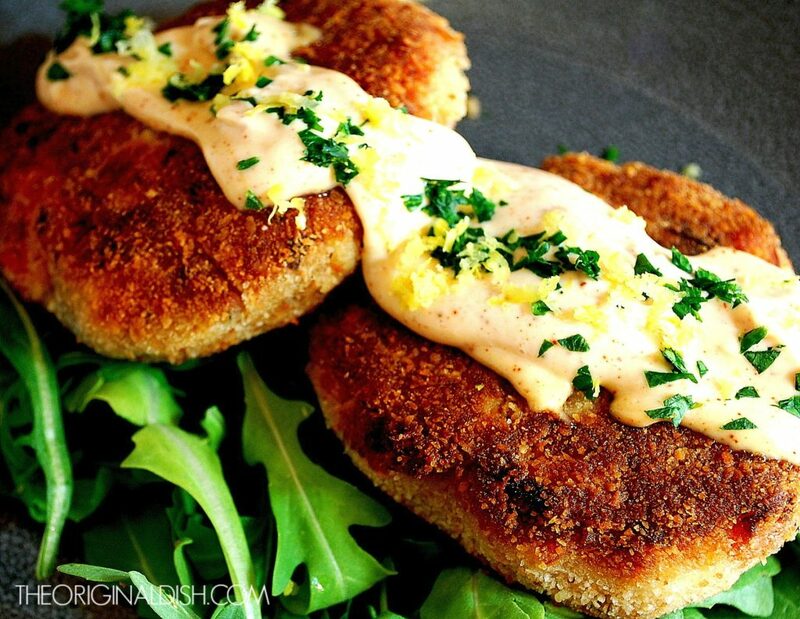 Combining the two creates the desired texture for these crab cakes.